The Hoddles Track starts at SaddleBack Mountains lookout. Difficulty: Hard, steep in parts. The Hoddles track trail head starts at the Saddleback mountain lookout. 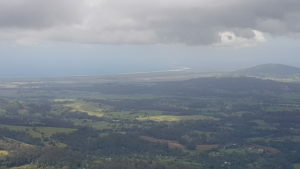 At the start it’s well worth the effort of wondering around to the 3 different lookouts to enjoy views over Seven Mile beach, lake Illawarra and Barren Grounds. They are spectacular. The start of the trail is not obvious. Head to lookout B, the Western platform lookout. There is a fire trail next to it. Walk down the fire trail towards Barren Grounds and that leads to the Hoddles Track. Once on the track it is well marked with green posts along the way. With walking around the lookouts the total distance is just under 8km. The trail is extremely steep in parts so wear the appropriate footwear. Also walking through the rain-forest can be very slippery when wet. So take it easy. This trail really surprised me with how impressive the views where and the amazing rain-forest it takes you through. Highly recommend checking this out. Google Map Link. From Kiama head up Old Saddleback Mountain Rd which will take you to the lookout. Below is google maps to assist you with directions to Saddleback mountain lookout. Hoddles Track bushwalk Photo Gallery. Hoddles Track bushwalking Youtube Clip. Google map of Hoddles Track trail head.